Cantabrian Mountains as a backdrop. The town is in two parts with one half containing most of the hotels and bars along the beach and the other half across the river, joined by a long bridge, where most of the shops are situated around the harbour. There was a festival due the coming weekend, something to do with canoeing, but already the town was overflowing with people, mainly Spanish and mainly young. Tents were everywhere, by the beach, in the parks, by the roadside and even on the roundabouts, it was chaos. The tourist office told me the campsites were full but I was welcome to put my tent up anywhere in town if I could find room. While looking for a place for the tent I saw one of the campsites. Sure enough they were full but I pointed out that there was a small area of grass behind their reception building with room for a few more tents. Spanish speaking went on, someone turned up on a ride on mower, cut the grass and I, as well as another 6 tents had somewhere to stay for the night. The town was a riot that night with the bars overflowing with people and cider. It seems Ribadesella is the centre of the pour cider from a great height custom, there was not a dry floor in the place. Ribadesella would have been an all night party if it had not been for the heavy rain that started at 2 am. The next morning there was mud and hangovers everywhere. 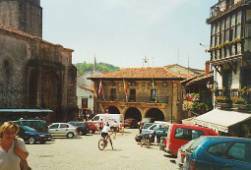 I contemplated staying at Ribadesella for a few days as I have seven days to ride the 100 or so miles to Santander before Kath gets there, but the town is too hectic for me so I set off when the rain stopped. Leaving Ribadesella I saw a small coastal road signposted to Llanes so I took it hoping to avoid the main road. This time I was lucky, it was a very pleasant twenty mile ride to Llanes with hardly any traffic and sunny weather. I met several pilgrims heading to Santiago, apparently this road is part of the North coast pilgrim path and some people chose to take this route rather than the traditional one that I had taken. To my mind there is no comparison, the traditional route is by far the most interesting of the two and I was tempted to warn them about the boring 500 miles in front of them. Well OK it is not boring it is just not nearly as good as the traditional Camino Frances. 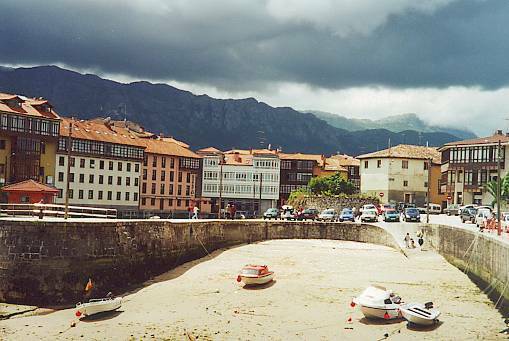 I stopped in Llanes for several hours and had a good lunch in one of the restaurants around the harbour, for once not deep fried. The town has some interesting old buildings and a fort, part of which now houses the tourist office. I met a couple of American cycling “pilgrims” also taking the North coast route. They had cycled through France and were trying to get a map of the North coast route and also pilgrim passports without much success. Over a few beers I suggested they ride inland to Burgos and join the traditional path there, after Llanes and Ribadesella there would be few interesting places until approaching Santiago if they continued along the North coast. Whether they took my advice or not I don’t know. 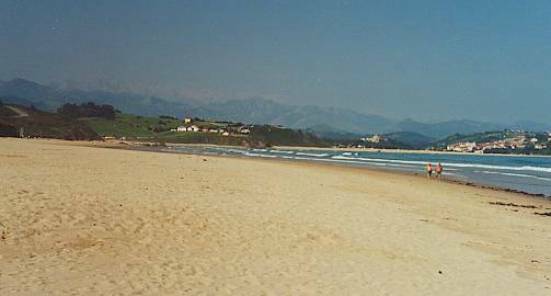 After Llanes it was back on the main road until I saw a small camp site on the beach at Playa de la Franca. The evening was spent drinking cider, poured from a moderate height, (better flat cider than on the floor cider is my motto) in the camp site bar where every one was watching a football match between Manchester United and (I think) Madrid. There was a lot of cheering from the Spanish watching as their side nearly scored but it remained goal less until just before the end, when Manchester scored. I cheered, the room went quiet and every one turned round. I smiled sheepishly then someone else cheered, luckily there were others from England there. There was not much to do at Playa de la Franca as it really was just a beach with a large and posh hotel and of course a camp site so wanting somewhere to stay more lively than this yet less lively than Ribadesella I cycled to San Vincente de la Barquera 14 miles along the coast to see what it had to offer. It rained heavily on the way and I arrived cold and very wet. San Vincente is a beautiful town set at the mouth of a river below the impressive Picos de Europa mountain range. 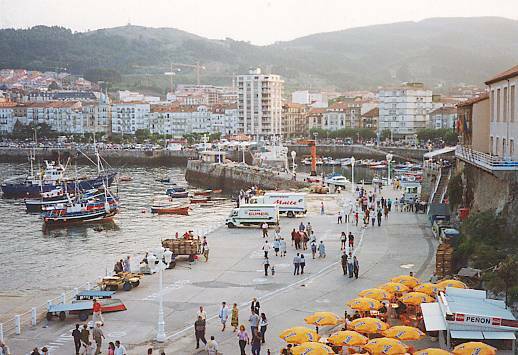 It is a working fishing port and is famous for its sea food. The camp site is on the opposite side of the river facing the town but as the long bridge to it is upstream a three mile ride is involved to get to it (or a short swim). There is a beautiful (and large) beach near the camp site. The weather improved and the sun came out just as I arrived at the camp site so I changed into some dry clothes and rode back to the town to look around and perhaps sample some of the famous seafood for lunch. There were seafood restaurants everywhere with tables on the streets, all were busy and, judging by what was being served all were very good, but the trouble was it seemed they only did menus for a minimum of two people and they started at a minimum of 8000 pts. That is about £30 and far more than I wanted to pay for one lunch. There was only one “normal” restaurant and that was full so I rode back to the camp site near where I had seen three other "normal" (i.e. cheap!) restaurants. They were serving the standard “menu del dia” but they were full too, so I waited until a table was free and sat down. Sorry that is not allowed, the minimum is two people at a table (well when they are busy anyway). Oh well sardines and bread again then, but I vowed to try the main town again that evening, there must be some menus that are not for two people only. That evening there were a few and I chose one that had lubina (bass) on offer for 3000 pts, again at nearly £12 not cheap but there was very little else at that price in the town and I was determined to sample something. It was horrible, deep fried whole in batter with garlic cloves, with a few chips and the usual small salad. It was like a biscuit, it had been fried for so long what little fish there was in the rock hard batter had all but disappeared. I told the waitress it was the most expensive meal I had had in Spain and without doubt the worst. She didn’t seem to care. I stayed in San Vincente for three days, it was a good camp site, the weather was great, I even sat on the beach for most of one day. At the camp site I met Steve, a bricklayer from Chichester who had cycled from Santander on a very old tandem with his seven year old daughter, Tara, on the back. She was a cute little thing and spent ages telling me all about her teddy Koali, a koala bear nearly as big as she was that she had insisted should come with them on the tandem. Never again said Steve as Koali was heavy and Tara didn’t peddle hard enough. Tara disagreed and apparently Kaoli did as well although Steve and I didn’t hear him say that. I followed a tiny coast road out of San Vincente as far as Comillas. Comillas is a small town on the Cantabrian coast, tucked into a little valley behind the Bay of Biscay. Yet you might think that you were in Catalunya. For the town contains a surprising number of buildings in the Modernista (the Catalan art nouveau) style, erected when it became—rather briefly—a fashionable resort at the turn of the century. One of these buildings, El Capricho, is a ceramic-laden fantasy by Gaudí. Domènech i Montaner, an architect almost equally famous in his day, designed an enormous hilltop seminary. The Marquis of Comillas lived in a summer palace designed by Joan Martorell, another notable Catalan architect. (anyone used to my writing style will be able to tell that all but the first sentence of this paragraph has been cut and pasted straight out of a guidebook). After Comillas I cycled through Santillana, a village of old stone houses and lots of tourists (famous in Spain for being picturesque and having nearby cave paintings, but there are too many tourists and the cave paintings are no longer open to the public) and then on to Viveda where I had difficulty finding a non motorway road to Santander but in the end I found a way onto the old N611 road which followed a very hilly and traffic free route into Santander. 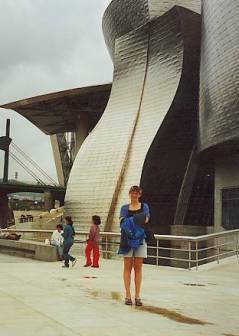 Santander is a large and mostly modern city, it was very hot and crowded when I arrived and I found the prices in the bars and restaurants expensive in the centre. The camp site (or sites as there are two of them next to each other) are on the headland near the lighthouse and about five miles from the centre. The beaches were very crowded and the camp site almost full perhaps because it was mid August and the height of the Spanish holiday season. It was not a very good camp site so I only stayed one night and the next day having looked around Santander moved back down the coast to one at La Virgen del Mar about twelve miles away by a beach and near a huge crematorium that must have covered 20 acres and surrounded by a 20 feet high stone wall. The evening was spent in the camp site bar chatting to Lotti, a very beautiful Austrian student and Andy, an Irish headmaster on a motorbike (they were not together). This was the evening I discovered that Spanish gin measures are about four times larger than English ones yet half the price. A very jovial evening until the bar shut at 2 am. Fell into tent. I rode the ten miles into Santander and arrived just in time to see the ferry about to dock. I was waiting for Kath to disembark when someone with a bike approaches and says “Hello John”. “Hi, um, who are you?” I reply as I was sure I did not know him from Adam. It turned out his name was Matt and he had been chatting to Kath on the ferry crossing and wanted to know where I had been and what it was like as he intended to do something similar. Kath turned up while we were discussing routes, hills, etc, it was good to see her but she looked a little pale, not enough sun in Cornwall I suppose. 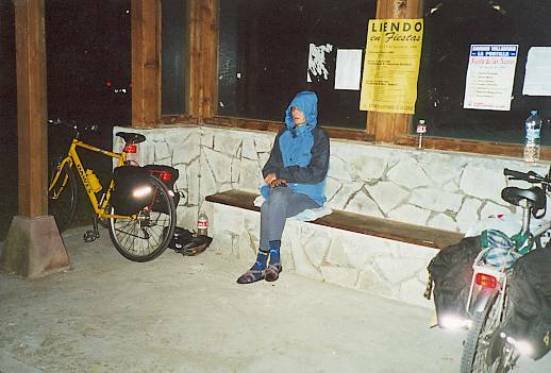 As we intended to stay in hostals and hotels on the 65 mile ride to the Guggenheim museum at Bilboa we left the tent, mattress and sleeping bag and anything else not required in the left luggage at the ferry port. This was as it turned out a very big mistake! We set off in high spirits, although it was a hot day and there was a lot of traffic on the roads out of Santander Kath seemed to be coping. It appeared we were riding on a motorway although it was not until El Astillero that we saw a “No bicycles “sign. There followed the usual problem trying to find an alternative road to the motorway but we did in the end after having a coffee in the local railway station cafe. The road was flat for several miles but just before Solares a hill appeared and Kath started to change colour as we rode up it. Half way up Kath complained her head was about to explode and she had to take shelter from the sun under a tree for a while. I felt sorry for her as it was a rather hot day for her first long bike ride and perhaps her black plastic horse riding helmet was not the best colour for reflecting the sun. She swapped the helmet for my Australian bush hat and we set off again, stopping in Solares to try and buy some water but we could only get small bottles at a bar, oh well , never mind, lets have a gin and perhaps the next bar will have larger ones. The next bar had gin and tonics and an African Grey parrot but only small bottles. Oh well “hic” , perhaps the next one. We rode on through undulating countryside reminiscent of Switzerland until we arrived at Colindres where we stopped for another G & T. Although we had only covered about twenty miles Kath thought that was enough for the first day and anyway it was almost half way to Bilbao and a good place to stop for the night. Trouble was the hostal in town was full and the only other one we were told about we couldn’t find. Oh well on to the next town Laredo then. The road to Laredo was flat but as we got nearer to the town it became very busy, some of the time we rode on the pavement to avoid the stationary vehicles. Where were these people coming from? What were they doing here? We soon found out, they were staying at (or perhaps trying to stay at) Laredo (or La-Bloody-Redo as we later called it). The town was full, there was no room anywhere we tried. “Todo completo” was the only answer we had. Kath was understandable depressed and in desperation, armed with our Barclaycard, tried the posh, and presumable expensive, hotels. They were all full too (phew!). Panic, what can we do? No rooms, no tent or camping gear, too late to go back. The only thing to do was to go on and hope there would be somewhere to stay out of town. There was the first serious hill to climb as we left La-Bloody-Redo and it was starting to get dark. Kath was by now suicidal. No she didn’t want to push the bike on the pavement, the middle of the road was fine. No she did not want to turn the bike lights on. No I was not to see if there was room at the hotel half way up the hill. I did anyway, please let them have a spare room. They were full. We finally got to the top of the 500m hill and Kath was off at great speed down the other side, obviously still suicidal, she shot off down a small side road that dropped steeply to a small village in the valley below. I got there some time after Kath and asked in the only bar/hostal if they had any room, no they were full. It was by now almost dark. We continued a few miles to the small village of Liendo, checked at the only hostal, yes it was full. There was a garage that had two or three caravans for sale on it’s forecourt so I asked if we could rent one for the night, "sorry, no"
"Could we just crawl under one then ?" We had noticed a bus shelter in the centre of the village and that would have to be where we spent the night as Kath was too tired (and far too grumpy) to go on and I had been told (by the caravan garage person) there was a 7km steep hill out of Liendo furthermore the next town of any size was about 20km away. We stationed ourselves at the only bar and drank the night away with large gin and tonics until the bar shut around midnight and then retired to the bus shelter for the night. We set off at first light as a lie in on the concrete floor of the bus shelter had little appeal, still it had been a warm dry night so things could have been worse. (not according to Kath). The hill out of Liendo was indeed long and steep. It took over an hour and a half to reach the top. The ride down the other side to an estuary below was spectacular. We could see the small seaside town of Orinon below us with a very steep side road leading down to it, it was not clear whether it was possible to get across the estuary at the bottom or whether the side road was the only way in and out of the town but as neither of us had had anything much to eat for 24 hours we decided to risk it. At the bottom there was just the one small shop/bar/café which luckily had just opened , it was rather a grubby little shop but we were grateful for a coffee and we bought some bread, cheese and ham and sat outside in front of the small church for a rather unusual breakfast. Needless to say there was no way to cross the river so we had to push the bikes back up the hill to the main road. The sun came out and it was a pleasant ride along the coast road through the small villages of Islares and Cerdigo to the town of Castro Urdiales where we finally managed to find a room in the Hostal Catamaran. There was no place to leave the bikes at the hostal itself but they had the use of a large underground car park in another street where we could leave them. As there was nothing to chain the bikes to in the main car park I opted to chain them to a compressor in a small side room. 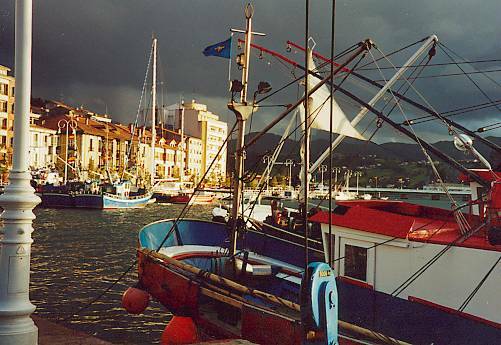 Castro Urdiales is a lovely little place, with lots of cafés and restaurants, and heaps of tourists, all Spanish. We had an excellent three course lunch with wine and bread for 1000 pesetas each (about £3.70). It started to rain. We sheltered from the rain in a little bar down by the harbour trying a couple of tapas or raciones or porciones or whatever they call them (according to how big they are): squid in tomato and herbs; squid in its own ink; potato omelette in bread; tomato, olives and anchovies on bread; assorted seafoody stuff, etc.etc. I never did find out what the one that looked like feet from a creature from a Star Wars movie was. The people at the next table seemed to be breaking the ends off and sucking out the innards. Nice! In the evening we end up at the same bar. This eating and drinking is getting to be a habit! I had marmita a local speciality a sort of lobster and potato stew, it was very good. Kath had melon surrounded by and covered with Serrano ham (like Parma ham but Spanish). On Saturday we catch the bus to Bilbo. That’s what the Basques call it. As one approaches the city, all the signs saying Bilbao have the ‘a’ sprayed out. Bilbo is closed. Many of the shops have signs saying ‘back on 1st September’. The Guggenheim was open however. There was a big queue. We retreated to a local bar to contemplate queuing. The local bar had lunches with bread and wine for the usual 1000 pesetas – that sounds like a good idea. Jeff Koons ‘Puppy’ was great. How do they get all the plants to come out at the same time? Who looks after them? It did look a bit like a ‘Kitten’ though. They do have modern art as well. I didn’t see the Klee, or Klee’s, but I did see the Pollock (it looks like the paintings John used to do with the help of his electric drill) as well as several Kandinsky’s and Miró’s. They also had lots by the Scream man, what was his name? A Norwegian. Munch was it? I didn’t know he had done anything else apart from the Scream. And then there was someone who created several of the ‘Athena’ posters, maybe Munas (I’m really good with painter’s names!). Pretty illustrations of, mainly, women in various stages of undress with flowery borders. They showed the original photographs of the models and then the posters. I think the best bit was Sugimoto’s photographs. Life-size, black and white portraits. Yes, that’s Princess Diana, yes, that’s Churchill, er.. that’s Henry VIII and his wives??? It turns out that he is taking photos of waxworks but they look so real. The building is very impressive with many different levels and constructional materials (I am told built without a single straight line, horizontal or vertical). You never quite know what you are going to see around the next corner. Worth queuing. Back to the point on the Bilbo map from where the bus leaves to Castro. It doesn’t look like a bus stop but a few people are milling around and then they leave. A nice Spanish gentleman comes up to explain that the bus drivers have gone on strike this afternoon. There are no buses. We will have to stay in Bilbo for the night and return to Castro tomorrow. What? After all that effort to find a hotel room? Not likely! John flags down a taxi. £4.00 to travel to Bilbo and £20.00 to return. I am too cross to talk to the taxi driver. How dare they have a strike on the afternoon I want to return from Bilbo? The evening in Castro is spent moving from bar to bar trying various tapas. The next day we have to return to Santander. We do not want to have to cycle all 53 miles in one day when there are serious hills involved. We return to the garage to reclaim our bicycles. A large BMW is parked so close to the side room door that we cannot open it enough to remove the bicycles. Oh dear. The garage, parking place, had been in the past a garage, as in mending cars, and John finds an old jack. Unfortunately the jack does not work. Then John finds a large piece of wood. He can force one of the back wheels of the BMW round to move it a bit. All the time the large red and white door is open on to the street and people are walking by watching us appear to be attacking the BMW. Hooray, John succeeds, powered by annoyance. We cycle back towards La-bloody-redo. Everywhere is still full. Laredo has a beautiful beach and we stop for a swim. We try the Tourist Information and offer the assistant our mobile phone to ring round the hotels but no luck. John wants to sleep on the beach but I am not keen. I would prefer to carry on cycling and find somewhere quieter. We are offered a bed for the night by another tourist, from Bilbo, but she is staying on the fourth floor and is not keen on bicycles. She also seems a little mad. It might have been good for my Spanish but … Our quieter spot turns out to be the doorway of the local Nissan garage on the way out of Laredo. At least it is under cover in case it rains. During the night something bites me. My right eye swells up until I look like something out of a Star Wars movie. What is this Star Wars connection? We start off very early in the morning, of course, and head for Santander. When we get there we try various hotels and they are all full. Time to go to the campsite. They are also full but are still letting in people with bicycles and tents but not cars. John leaves me on the pitch with all the baggage and returns to the left luggage at the ferry port to collect the tent and things. It’s only 5 miles back down the road. By the time we have set up the tent it is too late to explore Santander, and I think John would not have been impressed with another 10 mile cycle ride to the city and back. I think the good things about the trip were the food and wine. I don’t have any complaints about the Spanish people we met apart from the fact I was sometimes too grumpy to talk to them. They mostly understood me, enough to make me think I was getting it right. The scenery was interesting but not beautiful. The weather was either so hot you couldn’t see the mountains through the heat haze or raining so you could see nothing through the drizzle. Hot weather makes cycling up mountains more difficult but I can see it would be possible to get used to it. And there are always plenty of places to stop for refreshment, shade and a rest. The bad points were no beds, no showers, a bus strike, a parked BMW and a biting thing. I know I have suffered worse in the Bolivian jungle but somehow what is acceptable in Bolivia is not acceptable in Spain. We couldn’t shower in the jungle but at least we had beds. Maybe I can go without one or the other but not both.